The climate is changing – this much we know. The weather our buildings are supposed to protect us from is changing too. But how many of these changes can we anticipate, and how effectively can we respond? There are two sorts of change that we need to anticipate. First are the changes that are predicted by expert agencies such as the Intergovernmental Panel on Climate Change and the UK’s Met Office. These can be fed into building performance models to give us a pretty good sense of how a building will perform if these predictions turn out to be correct. And then there are the ‘wild card’ changes. Extreme weather events are expected to become more common as the climate changes – so more storms, floods, droughts and heatwaves. One of the wildest of wild cards is the potential of a rapid slow-down in the Atlantic meridional overturning circulation (AMOC) leaving the UK and Ireland with a much colder climate, as discussed by John Gibbons elsewhere in issue of 27 of Passive House Plus. Then there is the speculative nature of the science of prediction itself – all the climate models can offer us is probability-based scenarios, and these are based on assumptions of how much we manage to reduce carbon emissions, and by when. Which is something of an unknown, to say the least. Some projected changes are easier to understand because they are happening already. Summer temperatures are expected to rise, with high night-time temperatures a particular issue for people in cities dominated by hard surfaces. After the scorching summer of 2018, this reality is starting to hit home. Other changes that we are already experiencing include more intense rainfall events, and more storms – even hurricanes (Ophelia, which battered the UK and Ireland last winter, started life as a tropical hurricane). At the time of writing the tail end of Hurricane Helene was expected to arrive on these shores. If AMOC were to slow down significantly, the UK and Ireland would very likely have a much colder climate, similar to that of other regions at a similar latitude (think Newfoundland or the Baltic). But the prospect of more icy winter blasts at least makes it clear that designing for the future climate by using less insulation isn’t going to cut it. Even without northwest Europe descending into an Iceland-like climate, winter is still going to be the cause of a great deal of thermal discomfort and ill health in future (cold homes and fuel poverty are serious winter issues in Greece, Spain and many other ‘hot’ countries, with poorly insulated buildings a likely cause). And as the UK Committee on Climate Change pointed out in their 2017 risk assessment report, although the number of heat-related deaths in the UK is projected to increase as the climate changes, the numbers of cold-related deaths is still expected to remain much larger. Cold homes and fuel poverty are serious winter issues in Greece, Spain and many other ‘hot’ countries. Given that UK building regulations have not even caught up with designing for the present climate, perhaps it’s not surprising that they don’t require designers to prepare for the future either. The UK’s national building energy assessment tool, SAP, does not require overheating to be assessed. But things are beginning to change at local level. The new London Plan requires major developments to demonstrate how they will reduce the potential for overheating and reduce reliance on air conditioning. And Exeter City Council is not only commissioning new buildings to the passive house standard, but it also requires designs to be resilient to projected conditions in 2030, 2050 and 2080 (See ‘How Exeter is building for the future’). The UK’s new national planning policy framework also advices local authority planning departments to prepare for climate change. Ireland is also starting to address the issue. A new version of Part L for new dwellings, which went out to consultation this spring, requires “that the building is appropriately designed to avoid the need for cooling,” with guidance to be provided in Ireland’s national methodology, DEAP, for calculating an overheating risk assessment. The UK is “woefully unprepared” for deadly heatwaves. If, as expected, climate change makes our summers hotter as this century progresses, overheating in buildings is likely to become an increasingly serious cause of ill health and even mortality. Early analysis of 2018’s weather is already suggesting that there were between 600 and 1,000 extra deaths in the UK in this summer’s hottest fortnight alone, and older persons with heart or kidney problems were most vulnerable. The UK is “woefully unprepared” for deadly heatwaves, according to a House of Commons environmental audit committee report in July 2018. The committee’s MPs said the government had ignored warnings from the Committee on Climate Change, its official climate change adviser, and that without action heat-related deaths1 will triple to 7,000 a year by the 2040s. As well as the familiar issues with overheating – such as cardiovascular stress, particularly in elderly occupants — there is also the possibility of worsening air quality as volatile compounds from building materials, finishes and furnishings become more mobilised to the air. This is not a well-studied area, but elevated levels of formaldehyde, and other potentially toxic organic compounds have been reported in the air of buildings reaching temperatures only 7C or so above normal operative temperatures – not at all uncommon in overheated buildings2. ‘Your house is nice & cool - do you have aircon?’ asks Tesco delivery man. Not a fan or aircon anywhere. 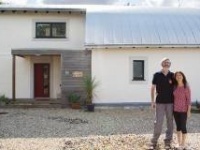 Just solar shading, good ventilation & brilliant design (it is a passive house)…Why aren’t all new houses in UK designed well? And no, it wasn’t costly. 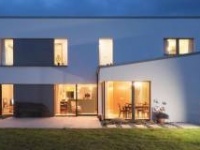 Because passive houses have heat recovery ventilation, which recovers heat from outgoing stale air and uses it to pre-heat incoming fresh air, they can be kept more comfortable than ‘regular’ dwellings: use heat recovery when it’s colder outside than inside; turn heat recovery off if it starts getting too warm indoors. And when it’s hotter outside than in, you can turn the heat recovery back on. This will keep heat out by returning it to outgoing air before it comes into the house (you could call this “cool recovery”) — meaning you can keep a passive house cooler than a normal building on very hot days. However, most UK buildings fail to deliver this kind of comfort. And as passive house consultant Nick Grant complains, too many building designers still fail to take summer comfort seriously. Solar and internal gains are still the big issue, he says. Caroline Martin of passive house design and certification firm Warm agrees. “Excessive glazing and full height glazing are easily identifiable flags for concern,” she says. But what about our existing, non-passive house buildings? Can we hope to protect their occupants from escalating hot weather? The good news is, many of our overheating buildings can, at least under current conditions, be made a lot more comfortable just by enabling the ventilation that is theoretically there. Highly-glazed and poorly ventilated existing buildings are likely to be the first to require retrofitted solar shading in future. This will not always be easy of course (particularly with tall buildings, where the more low-tech solution of external blinds probably won’t withstand the wind). But for all existing buildings, a simple but very effective measure will be to improve the provision of secure ventilation – in particular, at night. In some cases, a measure as simple as secure window closers allowing a window to be safely left ajar would make a huge difference. There have been repeated calls in the UK and Ireland for modelling of overheating to be made mandatory for building designers. With rising temperatures, simply testing designs against current summer conditions isn’t enough. The Chartered Institution of Building Services Engineers, CIBSE, has developed climate files, based on the UK Met Office’s 2009 set of climate forecasts, that can be used in building models to test designs against hypothetical future scenarios. The Met Office is set to publish a fresh set of projections later this year, and CIBSE research manager Dr Anastasia Mylona says the group will then model how these new projections are likely to affect building performance. At the moment, it is pretty much an accepted view among designers of sustainable buildings, that to install energy-hogging air conditioning is to admit a building has failed. This is a reasonable view while average outside temperatures are lower than comfortable indoor temperatures. But the principle doesn’t hold when outdoor temperatures rise so much that there is insufficient cool air available to remove unwanted heat from buildings. While the human body can adapt, to a small extent, to rising temperatures, the adaptive thermal comfort models – based on observation – accept that as temperatures rise, tolerance rises more slowly and is eventually overtaken: it’s too hot. At which point, given that we accept that it is legitimate to heat a cold space, does it not also become acceptable to cool a hot one? Climate change is expected to increase the intensity and frequency of severe rainfall events, and Dublin-based architect and building moisture expert Joseph Little thinks we should be taking this possibility seriously in how we design and retrofit buildings now. “Arguably we need to be building predominantly pitched roofs with wide overhangs and deep box gutters on commercial buildings as well as domestic,” he says. Architect Andrew Yeats runs the practice Eco Arc in the notoriously wet north-west of England, and many of his clients also occupy elevated sites. “Our rain mainly comes in horizontally,” he says. “If clients ask for a flat roof I just say no. For an exposed location I insist on a steeply pitched roof, big overhangs and big gutters, and I won’t have anything to do with balconies or parapets. “I always insist on a ventilated cavity over a timber frame, so any rain that gets though can just run down the back of the rainscreen without touching the main structure. “I’m queried about this by timber framers, may often offer a system with a board that can be fixed to the frame and rendered. But boards are likely to move, if only infinitesimally — but once you have a crack of any kind, the driving rain will find its way in, leading to more movement, and more water penetration.... it’s a disaster waiting to happen. Yeats believes tremendous care is needed when retrofitting energy efficiency measures to a traditional building that faces – as most buildings will, sooner or later — extreme rain events. 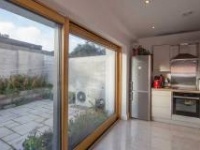 “For retrofit we much prefer to use external wall insulation. We tend to use a rendered EPS [expanded polystyrene] system.” EPS is more vapour open than polyurethane foams, but the theory is that it is not damaged by rain if it should get in. Indeed, retrofit of insulation in the UK and Ireland is already failing in regard to moisture (as seen in the disastrous retrofits in Fishwick, Preston, reported in Passive House Plus issue 24). An increase in driving rain and extreme rainfall events is only going to make the situation worse. Joseph Little believes the common “budget” detail for external wall insulation, used at Preston — in which roof eaves are not extended to make room for more insulation underneath, but instead insulation is stopped short of the roof — should be banned. “If the roof can’t be extended and the wall protected, the works should not be done,” he says. He also shares the concerns of many about retrofitting cavity insulation where driving rain is now, or promises to become, a risk. “Arguably we shouldn’t be filling any narrow cavities in external walls,” he says, meaning cavities less than 75mm wide. He says many wall cavities have been insulated with fibre and bead in contravention of the BRE’s “compelling cautious guidance” in the BR262 document on avoiding risks with insulation. Little believes that warmer, wetter weather will stress wall build-ups more, and that in future cavity insulation may only be used for new-build wide-cavity rendered walls, and for renovation in areas with low exposure to rain. “I suspect there will be a very active industry removing insulation fill in the years to come,” he says. He also warns that — with the number of violent storms expected to increase — wind uplift calculations may need to be rethought, and at the site level, roof slate and tile nailing practices currently adopted in more exposed locations, such as double nailing of each slate, should become standard. Is the culture of construction ready for climate change? “For example, should buildings – or at least parts of them — be completely demountable, so all of their components can be taken apart and reused or reconfigured?” Perhaps one way this approach can be put into practice right now is during repairs of flood-damaged building. Currently, this tends not to make the building any more resilient to flooding than it was previously. Urban design consultancy URBED looked into the way flood repairs were carried out in Cumbria after the devastating floods of 2015, and found damaged buildings were being re-instated ‘as was’, even though this was the second flood in 10 years for some properties. URBED recommends that flood repair makes a building more resilient to future flood events, to reduce the need to strip out materials (reducing waste), and reduce drying times. Some of their recommendations are very simple – such as fitting plasterboard horizontally across a wall so less needs to be removed when only the bottom foot or so of a wall is damaged, or using water-resistant materials such as magnesium oxide boards instead. All the above is assuming we can go on building, occupying and maintaining buildings more or less the way we do now. Is this likely? If the more extreme predictions for climate change come true – for example if the AMOC completely shuts down – or we fail to cut emissions, what kind of society and economy will be the setting for these buildings? Can we envisage a way in which our buildings will still work well, even with intermittent power and water, intermittent money, and much less “stuff” generally? Geometry is a very basic key to resilience. A building with a poor form factor will get colder in an arctic blast – and in a power cut. An over-glazed building will overheat the most in a heat wave – and if it requires intensive cooling to prevent overheating, it will be a hell-hole in a power cut. Andy Simmonds believes that we now need new or adapted building standards that measure and verify not just carbon emissions or energy efficiency, but also climate-adaptability. “These need not be complex or onerous,” he says. “And thermally comfortable, beautiful buildings with great indoor air quality need not be ostentatious.” Buildings and built environment professionals alike would do well to embrace modesty, simplicity and flexibility, he says. The Extra Care scheme, designed by Architype, in Exeter. Exeter City Council, pioneers of building to the passive house standard, also require their buildings to be resilient and comfortable in projected climatic conditions for 2030, 2050 and 2080. St Loye’s Extra Care Scheme is a new £9.8m passive house development in the city that will provide independent living for older persons. Designed by Architype, the scheme will feature 53 affordable apartments plus lounges, dining rooms, roof terraces, hobby spaces, spa treatment rooms and landscaped gardens. To ensure the apartments will remain comfortable long into the future, engineering consultancy e3 carried out modelling of the proposed design under future climate change scenarios using the IES software. This modelling showed that while the natural purge ventilation would be expected to keep the apartments comfortable under current conditions, there would likely come a point where a small amount of cooling would probably be needed to protect the vulnerable elderly residents. The solution chosen by the team was to install a centralised ventilation system (which also made sense for other reasons) so that a cooling coil could easily be retrofitted to the supply air duct serving the building in future. 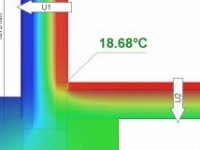 The analysis predicts that from 2050 onwards the building will remain comfortable if the supply air temperature to each flat is cooled by 10C. Because the apartments are passive house, the cooling load is expected to be very small – but it should make all the difference to the comfort of residents.